Exactly who owns the electronic health care records? Does the OHIET own them? The patient? The provider? Or, does the state of Oklahoma? Does the Trust Estate include those electronic health records that come into being as a result of the adoption and use of electronic health records systems? The information on this page deals mostly with the Oklahoma Health Information Exchange Trust, a public-beneficiary trust referred to as the OHIET, but includes other information as well. A trust of this type (or possibly an LLC or other legally recognized entity), and related state initiatives, has probably been created in your state to implement and establish the foundations necessary for what the public calls Obama Care. Health care reform (Obama Care) started long before the passage of the Patient Protection and Affordable Care Act (PPACA). Health care reform is really about replacing our traditional medical system with a nonhuman, technologybased, universal health care system. It means to replace real doctors with virtual doctors; to globally share our most intimate information with people and entities we've never heard of or know; and works to sever the onceconfidential relationship between patients and doctors. Called health information exchange (HIE), this personal information sharing is being done mostly without the knowledge or consent of the people. In Oklahoma, this health information exchange effort is being advanced by the Oklahoma Health Information Exchange Trust (OHIET). This page contains information specific to Oklahoma but will be beneficial for other states as well, since the pattern of implementation is roughly the same through the U.S. and its territories. The pattern of activities in your state, leading up to the passage of PPACA (The Patient Protection and Affordable Care Act, aka Obama Care) probably went the same way it did in Oklahoma. Negative reports issued about the health status of the citizens of your state. Participation in the federally initiated ONC (Office of the National Coordinator) Health Information Technology Security and Privacy Collaborative program in 2004 or later. A state biometrics/biotechnology initiative began, tied to a research university. Electronic health information exchanges (HIE) are established in the state. Participation in Medicaid Reform effort and a demonstration project utilizing the use of electronic medical records, data collection, analysis and reporting. Participation in HITECH Programs, funded with American Recovery and Reinvestment (ARRA) grant monies, such as Beacon Community Programs (Tulsa, OK area); the State Health Information Exchange Cooperative Agreements (first awarded to the Oklahoma Health Care Authority, then transferred to the OHIET); Regional Extension Centers (located in Oklahoma City); and others. Expansion of broadband access in the state, ostensibly to reach the rural areas. The intent here is to increase access to and use of electronic health care systems. Creation of a publicbeneficiary trust (or other legal entity), not subject to legislative oversight, that facilitates and expands the electronic movement and use of health information, both in state and out of state and which can award those highly lucrative IT contracts to pre-determined, qualified companies, that make the whole system work. Awarding of contract for a medical decision support tool, a software program that can quantify desired health care outcomes, such as the Archimedes IndiGO model. This trust is governed by seven appointed trustees, without legislative oversight. The Trust and its beneficiary (the state of Oklahoma) has immunity against claims. This publicbeneficiary trust was created in 2010 with the passage of SB 1373, a short bill that started out dealing only with Chronic Obstructive Pulmonary Disease (COPD), but which was later used as the vehicle to create the trust. The amendatory language creating the OHIET was added to the COPD bill in the last week of May 2010, at the end of the 2010 legislative session. SB 1373, as amended, passed both chambers with littletono debate: in the Senate by a vote of 450, and overwhelmingly in the House, with only two votes against it  by Reps. Reynolds and Ritze. David C. Kendrick, MD  OU-HSC, Kaiser Chair of Community Medicine; CEO of MyHealth Access Network, a Tulsa Beacon Community program; formerly with Archimedes, Inc.
Robert H. Roswell  OUHealth Sciences Center; Chair of the HISPC, Information Technology Work Group, Co-chair OK Health Information Exchange Cooperative Agreement Program Oversight Working Group, etc. *Yeaman resigned from the OHIET and now is the Principle Investigator (PI) for the Challenge Grant, Care Transitions. The Challenge Grant is overseen by the OHIET. According the OHIET budget and narrative, the PI is budgeted for 20 hours per week for the duration of the project, with a rate of $300/hr. Quite a nice gig, isn't it? At the taxpayers' expense. reduction of administrative costs and any other benefits deemed appropriate by the Trust. The list of purposes covers 16 different types of activities, including incurring indebtedness. The Trust Estate  Including Electronic Health Records or Data Created by Them? The Trust can accumulate an estate, that includes funds and property, including leasehold rights, money, property (real, personal, intellectual or mixed), leases, privileges, immunities, licenses, franchises, benefits and all other things of value. as the Trustees shall determine necessary for the benefit and development of the Beneficiary (in this case, the state of Oklahoma). Again the question arises  do the electronic health records, or data collected from their creation and exchange, become the property of the Trust? Can they exchange or sell that information? Can this health information exchange, with its IT infrastructure, constitute a service or be considered a commodity? If so, can this service/infrastructure be sold or outsourced? If so, there are countries actively pursuing foreign direct investment in states' IT infrastructures  including China. 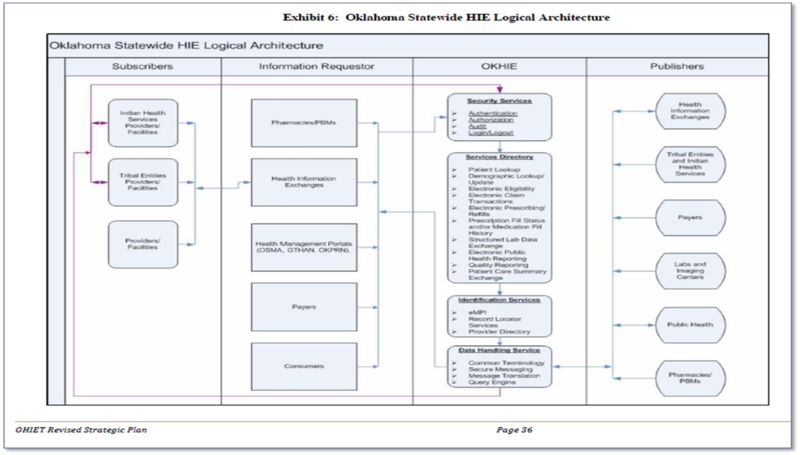 The OHIET Oklahoma Statewide HIE Logical Architecture  do we really want this information sharing nightmare in our state?